On March 20th, 2019, the first members of the Young Academy Leiden (YAL) were installed (Article in Dutch). I will be a member of this group of young researchers for the coming five years, representing the Institute of Public Administration and the Faculty of Governance and Global Affairs. The activities of the group will range from interdisciplinary exchange, outreach to society, and giving input on university-internal policies. Looking forward to working with this enthusiastic, creative and passionate group! Together with Dr. Reuben Ng, I co-edited a special issue on ‘Big Data in Governance and Policy’ in the Journal of Politics and Governance. The whole issue is open access and can be found here. The issue highlights the lack of engagement in the current literature with the application of big data at the cross-section of governance of data and its utilization in the policy process and draws out aspects related to its definition and future research agenda. The contributions highlight several aspects related to big data in different contexts, such as local and national government as well as a variety of policy areas. They converge on the idea that big data applications cannot overcome existing political and structural limitations that exist in government. This leads to a future research agenda that looks at the disconnect between data production and usage as well as identifying policy issues that are more or less suitable for data analytics. The Editorial summarizes the findings of the articles. The paper published in Energy Policy together with Dr. Ishani Mukherjee presents a conceptual overview of how the intersection of big data and behavioral knowledge would work in the renewable energy sector. We indicate that inserting behavioral insights into the energy instrument mix is complex due to technological trajectories, path dependencies and resistance from incumbent industries to change production patterns. We also highlight the underutilized role of large behavioral datasets that can inform not only policy implementation, but also policy design and evaluation efforts. Drawing on these findings, we introduce future research streams of government capacity in combining behavioral insights and data, the compatibility of this information with existing policy instruments and how this affects policy change. 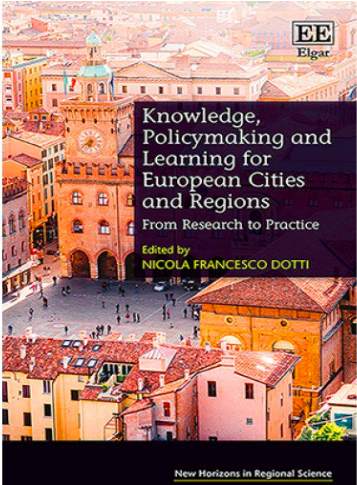 The chapter is published in the book 'Knowledge, Policymaking and Learning for European Cities and Regions' (edited by Dr. Nicola Dotti) and analyzes the effects of outsourcing on big data analytics skills in (local) government. Outsourcing of big data analytics due to a skill shortage in public administrations has affected policy learning at local level. Similar to the ICT developments in the 1990s that were accompanied by a New Public Management and evidence-based policy logic, the changes challenge government by creating a fragmented structure with limited feedback loops. This chapter points towards such developments in the UK, where especially local learning is restricted by siloed data analytics systems largely owned and operated by private organisations. The paper (co-authored with Dr. Nadine Raaphorst) aims to unravel the hindering factors of implementing digital public services, using electronic health records as an example. There are several elements as to why digitization of public services is progressing slowly. Many explanations center on structural aspects of public institutions and their capacity and capabilities to implement digital tools. Others highlight the uptake by citizens as key to making technical solutions in the public domain work. This paper draws attention to a third line of argumentation by focusing on the role of street-level bureaucrats. Based on the assumption that they are caught in between the technical details of digital public service delivery and the organizational context in which these tools are implemented, the goal is to identify some of the factors that hinder the use of digital applications by street-level bureaucrats. To unravel those hindering factors, we use the “failed” implementation of electronic health records in the United Kingdom as an example in order to link it to existing research on digital governance and street-level bureaucracy. We conclude that the disconnect between organizational structures and digital tools is magnified at street-level, which may threaten discretionary power and autonomy of public servants and can make daily tasks more complicated and time-consuming. Policy implications drawn from this include, paying special attention to the trade-off between local autonomy regarding the adjustment of digital tools and national guidance and standardization as well as the distinction between the potential inability of public servants to use the tools due to limited training or age and the unwillingness linked to a loss of power and discretion. The chapter (co-authored with Dr. Uli Mans & Thomas Baar) is part of the book 'Urban Planet, Knowledge towards Sustainable Cities' edited by Elmqvist et al. (published with Cambridge University Press). The overall book is concerned with global urbanization and its promise to better services, stronger economies, and more connections while also carrying risks and unforeseeable consequences. It takes an integrative look at our urban environment, bringing together scholars from a diverse range of disciplines: from sociology and political science to evolutionary biology, geography, economics and engineering. It includes the perspectives of often neglected voices: architects, journalists, artists and activists. The book provides a much needed cross-scale perspective, connecting challenges and solutions on a local scale with drivers and policy frameworks on a regional and global scale. The authors argue that to overcome the major challenges we are facing, we must embark on a large-scale reinvention of how we live together, grounded in inclusiveness and sustainability. The chapter looks at the role of big data in managing the urban environment linked to the underlying dynamics of urban life and policies aimed at improving social cohesion. This chapter aims to contribute to this emerging discourse about how big data can improve urban policy-making, and focuses on the role that this technology can play in building more inclusive cities in the Global South. We highlight the need for urban authorities to invest in additional resources as well as meaningful knowledge transfer mechanisms that are in line with the concept of “mobile urbanism.” This is particularly important in low-income cities, where policy-makers are driven by the desire to address urban violence and to build more inclusive cities across different constituencies. The article is published (open access) in Regional Environmental Change and addresses entrepreneurial strategies in the Swedish wind energy context. Thereby, the chapter aims to contribute to this emerging discourse about how big data can improve urban policy-making, and focuses on the role that this technology can play in building more inclusive cities in the Global South. We highlight the need for urban authorities to invest in additional resources as well as meaningful knowledge transfer mechanisms that are in line with the concept of “mobile urbanism.” This is particularly important in low-income cities, where policy-makers are driven by the desire to address urban violence and to build more inclusive cities across different constituencies. A growing body of literature focuses on how the context in which policy entrepreneurs operate shapes their actions. This study contributes to this perspective by focusing on the regional implementation of wind turbines for increasing renewable energy levels in Sweden. Sweden introduced national wind coordinators for facilitating wind energy implementation. In this capacity, the coordinators carry out entrepreneurial strategies in form of moving the policy through the administrative agenda at local level and pursuing the implementation process together with municipal stakeholders. The study shows that over time, wind coordinators were able to move beyond the government-defined activities and widen the scope of their actions. The analysis offers insights into the temporal dimension of regional entrepreneurial activities by mapping activities from 2006 to 2016. The case reveals that a flexible policy framework and more in-depth knowledge into regional struggles through mediating and networking enable the identification of potential local bottlenecks and lobbying for legal changes by entrepreneurs. My interview with the Leiden Centre of Data Science (LCDS) is now online (English version/ Dutch version). I talk about government & data as well as current research projects and collaborations. Thank you to Jessie van den Broek for posing great questions! As part of the book 'Advances in Food Security and Sustainability, Volume 2' edited by David Barling, my colleagues Gerard Breeman, Dovile Rimkute and I published a chapter on "Food Security and the Sustainability of GMOs in the United States and the European Union". The book can be found here. My thoughts on the niche that the Data for Policy conference fills when it comes to work at the intersection of public policy and data science research. Dr. Reuben Ng (Lee Kuan Yew School of Public Policy, NUS) and I have launched a special issue call on "Big Data Applications in Governance and Policy", which will be published in the Journal Politics and Governance next year. Details on the call can be found here. We invite contributions on the topic of big data applications in governance and policy. The main research question guiding this issue is ‘how has big data shaped data governance, policymaking and practice’? Big data has taken shape in various theoretical and practical forms when it comes to policymaking. In this larger context, we focus on two major themes: First, the governance of big data, and second, the way that big data information enters the policy cycle and thereby contributes or challenges policy development and implementation. The first theme builds on a large set of literature focusing on e-government and digital public service delivery. This includes aspects of moving towards digital service delivery from a civil servant, but also from a citizen perspective. The second theme relates to the literature on evidence-based policymaking, public administration, and the question what role data as evidence plays. This focuses on topics that have been raised within this context regarding the weight that is given to data as one type of evidence and at what point of the policy cycle this type of information enters the policymaking process. Looking at these two themes, we seek to unravel the ways that big data impacts governance, policymaking and public administration. Both can be addressed by presenting new theoretical and methodological approaches for analyzing government use of big data in various ways. Together with Dr. Ishani Mukherjee, I published a paper in 'Public Policy and Administration' on the role of policy entrepreneurs in the European Commission Trading Scheme. The paper can be found here. Abstract: The paper focuses on enterprising agents in policy formulation and design by looking at their capacity of dealing with different levels of uncertainty. In climate policy specifically, different degrees and types of uncertainties pose a challenge to policymakers. Policy entrepreneurs and the combination of their analytical, operational and political competences are a relevant component in reducing ambiguity in policy design and translating broad policy goals to operational programmes and specific policy instruments. Using the case of the European Emission Trading Scheme, we suggest that the success of policy entrepreneurs in catalysing policy change is determined by their capacity to work against multiple kinds of uncertainty. This ‘uncertainty mitigating’ capacity on the part of policy entrepreneurs rests significantly on balancing managerial expertise and political acumen. We conclude that entrepreneurial capacity goes beyond current definitions in the literature, involving the balance among analytical, operational and political competences to navigate a politicized policy context. Policy Design and Practice (PDP) has one goal: to be the source of the best new ideas for people creating, leading, and transforming policies throughout the world. PDP publishes cutting-edge, authoritative thinking on the key issues facing policy makers and is proud to contribute to better governance across sectors, countries and regions. Policy Design and Practice is about promoting and developing better government through better policy design and implementation. All of us are better off if government leaders and public officials made better decisions and implement them more effectively. PDP covers a wide range of topics related to policy-making processes across a wide variety of sectors, and across a wide range of governance contexts, from international to local governments. PDP articles are written for practitioners by experts whose authority comes from careful study, analysis, and experience. The ideas presented in these articles can be translated into action and have been tested in the real world of policy-making. PDP articles demonstrate fresh thinking that advances previous knowledge, and whose practical application has been thought through clearly. PDP articles are short (4,000-6,000 words) and jargon-free. The paper (open access) published in Policy Sciences has the goal of answering the question whether big data is a fleeting trend or has long-lasting effects on policymaking. Three larger themes in the literature are identified: First, the role that institutional capacity has within government to utilize big data analytics; second, government use of big data analytics in the context of digital public services; and finally, the way that big data information enters the policy cycle, focusing on substantive and procedural policy instruments. Examples from the education, crisis management, environmental and healthcare domain highlight the opportunities and challenges for each of these themes. Exploring the various aspects of big data and policymaking shows that big data is here to stay, but that its utilization by government will take time due to institutional barriers and capacity bottlenecks. This publication in Administration and Society (open access) focuses on trust dynamics in innovation networks. Individuals and organizations within the network play an important role in creating trusting relationships. Using this as a basis, the article explores the dynamics of trust when relationships and positions within the network change. Counter to the expectation that relationships are formalized in this scenario, the article shows that in the Chicago case, trust is layered. The article concludes that third-party sources of information about trustworthiness are strategically established as a layer in the network and that individuals translate past interactions into lasting organizations that can facilitate trust. The paper published in European Planning Studies (open access) addresses the growing scepticism around big data use in the context of smart cities. Big data is said to transform city governments into being more efficient, effective and evidence-based. However, critics point towards the limited capacity of government to overcome the siloed structure of data storage and manage the diverse stakeholders involved in setting up a data ecosystem. On the basis of this, the paper investigates the challenges city governments face when dealing with big data in the context of carbon emission reduction. Through the lens of the evidence-based policy and policy capacity literature, the cities of Copenhagen (Denmark), London (UK), Malmö (Sweden), Oxford (UK) and Vienna (Austria) are analysed. The cases reveal that the institutional complexity underlying big data integration limits local government capacity to set up data management structures that would allow further utilization of big data and that current solutions focus on local pilot sites and outsourcing of data analytics. Combining different disciplines, Leiden University researchers work together to formulate innovative solutions to societal problems. I am part of a team of experts on complex problems connected to my research in the fields of comparative public policy, environmental policy and regulation, big data and urban innovation. Some phenomena cannot be studied in isolation. They are linked within a chain of cause and effect that spans the whole world. As an example, environmental pollution leads to climate change that causes the worst drought in southern Africa in 112 years. Harvests fail and cattle die of starvation; society becomes disrupted. All this leads to a massive wave of migration. The arrival of refugees fuels simmering discontent in European countries and creates a political earthquake. It takes a very diverse body of knowledge to be able to reverse these kinds of developments, knowledge ranging from chemistry, biology and environmental sciences to anthropology, political science and public administration. More information can be found here. 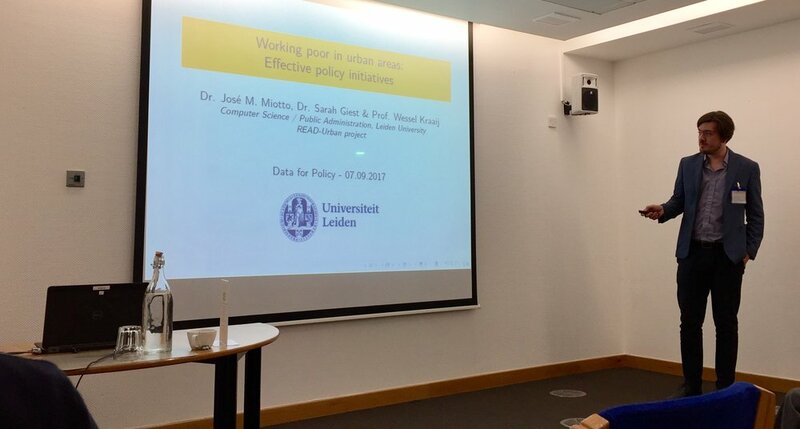 To kick off a newly started collaboration between the Leiden Institute of Advanced Computer Science (LIACS) and the Faculty of Governance and Global Affairs (FGGA), we had a session on Governance and Data Science. The discussion largely evolved around the role of new methods for policymaking and the questions social science poses for computer science research. I gave a presentation entitled 'Big Data for Policymaking: Fad or Fast Track? ', looking at some of the big data promises and realities and the challenges of government to incorporate big data tools into the policymaking process. 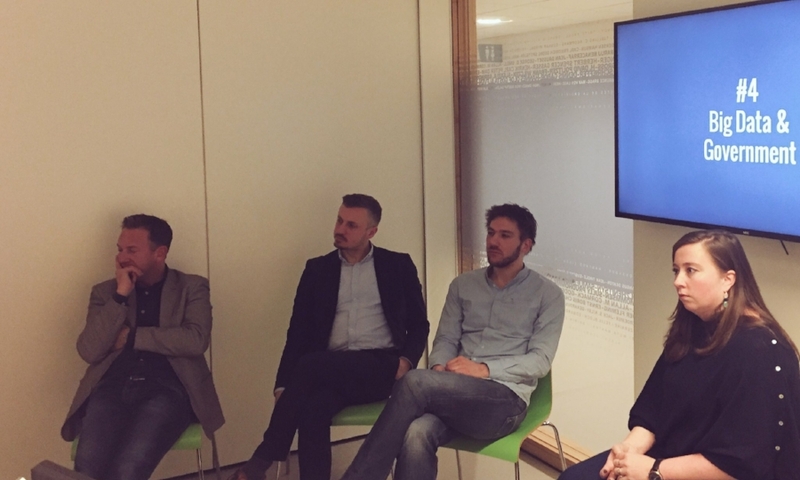 The expert panel of Kim Grondsma (Ministerie van BZK), Rogier Kleinekoort (Municipality Den Haag), Dr. Jelmer Schalk, (Leiden University, Public Administration) and Dr. Christoph Stettina (Leiden University, LIACS) completed the elective 'ICT in the Public Sector'. We had a lively discussion on three major themes: Leadership & technology-oriented change, technology & public services/ performance and big data and government. In the conversation among the panel members and with students, it became clear that there are structural challenges that governmental levels and departments struggle with to execute and utilize some of the technology available. We also saw that providing public services can hold very different implementation motivations than having a business case in the market. All in all, an interesting debate! Check out my new post on the LSE Impact Blog about Civic Apps! "...some type of gratification mechanism can make these apps sustainable. These include, for example, gaining support from other citizens for a project proposed to the city (endorsements). There is further a closed feedback loop in the sense that citizens can follow-up on their complaints or projects. These gratification mechanisms need to be linked up with the role of political efficacy in civic engagement in the sense that the more an individual has the sense of personal competence in influencing the political system, the more they will engage." Come join our panel on 'The Data/Sensor Revolution and Public Policy' at the International Conference on Public Policy in Singapore (28-20 June).